This photo was taken on May 6, 2013. The location was in the Catalina Mountain foothills near Tucson, Arizona. The "Take It!" 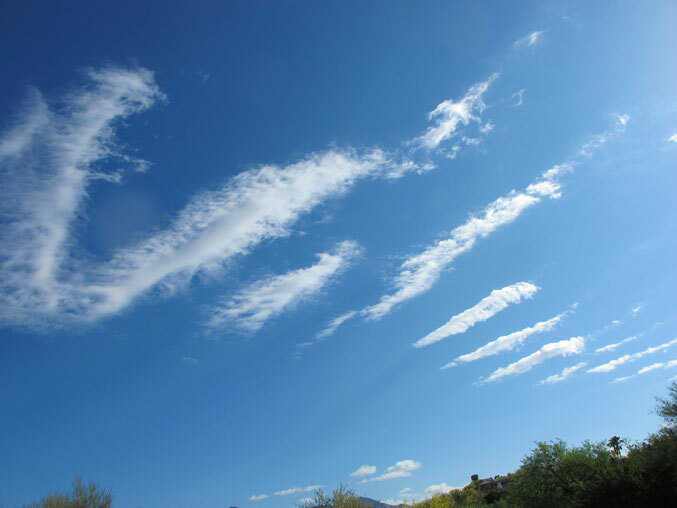 was the near perfect line up of clouds to almost make a word. It was as if there was a plane up there skywriting that had mispelled a word. I must say it was beautiful even with not knowing what it was trying to say. The After take: This was an instant favorite as those to whom I showed it to shared in my disbelief that such a thing happened all on its own. There were several guesses on what the word might have been, which was fun to watch people go through their thought process to come up with their best guess. Nature is full of surprises. It is hard to say which part of nature puts on the best show, however, the sky is a spectacular stage. Here is hoping you too will have a little time each day to look up at the sky, and see what it has to offer. Try not to rush yourself, for many times it is a refresher. What a great setting and looks like a beautiful day! It looks like they tried to write villian. Such a cool shot. It really does look like wordage of some sort.